MacroMania: Money and Payments, or How we Move Marbles. I'm writing this to serve as background for my next post on Fedcoin. If you haven't thought much about the money and payments system, I hope you'll find this a useful primer explaining some basic principles. I view the payments system as a protocol (a set of rules) for debiting and crediting accounts. I view money as an object that is used to debit/credit accounts in a payments system. I view monetary policy as a protocol to manage the supply of money over time. Collectively, these objects form a money and payments system. One way to visualize the money and payments system is as a compartmentalized box of marbles, displayed to the right. The marbles represent agreed-upon monetary tokens--record-keeping devices (see also the discussion here). The compartments represent individual accounts. Paying for a good or service corresponds to moving marbles from one account to another. What makes a good marble? What is the best way to manage the supply of marbles over time? And what is the best way to move marbles around from account to account? There are books devoted to addressing these questions. A good marble should have easily recognizable and understandable properties. This is one reason why complicated securities make poor money. Fiat money and senior claims to fiat money make good money along this dimension because everyone knows that fiat money is a claim to nothing (so there is no asymmetric information, a property emphasized by Gorton and Pennaccchi, 1990). Gold, even if it is coined, is not especially good along this dimension because it is heterogeneous in quality (and it's not costless to have it assayed, see here). Plus, precious-metal coins can be shaved (although, there is no motivation to shave token coins). 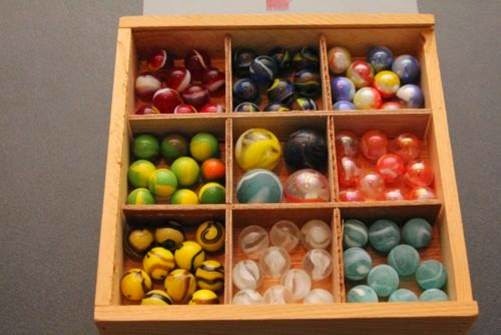 How should the supply of marbles be managed over time? Advocates of the gold standard want the supply to be determined by the market sector (through mining). This protocol means that the supply of money is essentially fixed over short periods of time, and grows relatively slowly over long periods of time (although, big new discoveries have often led to inflationary episodes). If the demand for money increases suddenly and dramatically (as it is prone to do during a financial crisis), then the consequence of a fixed short-run supply of money is a sudden and unanticipated deflation. Because nominal debt obligations are not typically indexed to the price-level, the effect of this protocol is to make a recession larger than it otherwise might be. The idea behind a central bank as lender-of-last resort is to have an agency that can temporarily increase the supply of money (in exchange for "excessively" discounted private paper) to meet the elevated demand for money so as to stabilize the price-level. In effect, such a policy, if executed correctly, can replace the missing state-contingency in nominal debt contracts. Whether a central bank can be trusted to manage such a policy in responsible and competent manner is, of course, another question. Let's just say that there are costs and benefits to either approach and that reasonable people can reasonably disagree. Apart from cyclical adjustments the money supply, there is the question of whether money-printing should ever be used to finance operating expenditure (seigniorage). Generally, the answer is "yes"--at least, once again, if it is done responsibly. It is of some interest to note that the Bitcoin protocol uses seigniorage to finance payment processors (miners). The idea here, I suppose, is that the protocol, which is a computer program and not a politician--can be trusted to manage the inflation-tax optimally. That is, at least for a limited amount of time--the long-run supply of bitcoin is presently capped at 21M units. Alright, so how about the payments system. What are the different ways of rearranging marbles in a ledger? The most basic method of payment is the combination of a physical cash exchanged in a P2P meeting. When I buy my Starbucks latte, I debit my wallet of cash and Starbucks credits its cash register by the same amount. The ledger that describes the distribution of physical cash holdings (and the histories of how each unit of cash has moved across accounts over time) is hidden from all of us. This is why cash transactions are associated with a degree of anonymity. Another popular way to make a payment is via a debit card. In this case, Starbucks and I have accounts in a ledger that is managed by the banking system. These accounts are stocked with virtual book-entry objects. When I pay for my latte with a debit card, I send a message to the banking system asking it to debit my account and credit the merchant's account. In this protocol, the banking system verifies that I have sufficient account balances and executes the funds transfer. The protocol obviously relies on the use trusted intermediaries to manage the ledger and keep it secure. Also, because bank accounts are associated with individual identities and because centralized ledger transactions can be recorded, there is no anonymity associated with the use of this payments protocol. The Bitcoin protocol is an amazing invention--I'm on record as describing it as a stroke of genius. The amazing part of it is not it's monetary policy (which I think is flawed). Its main contribution is to permit P2P payments in digital cash without the use of a centralized ledger managed by a trusted intermediary. (In fact, the economic implications of this invention extend far beyond payments; see Ethereum, for example). There is no need to get too far into the details of how the Bitcoin protocol manages this feat. If you are interested, you can consult this book by the inspirational Andreas Antonopoulos. The main idea behind the protocol is a distributed public ledger (called the block chain) that is updated and made secure through the collective efforts of decentralized payment processors (called miners). I find it interesting how the Bitcoin consensus mechanism resembles, in spirit at least, the communal record-keeping practices of ancient gift-giving societies. In a gift-giving society, who contributes what to the collective good is recorded on a distributed network of brains. This is easy to do in small societies because there's not much to keep track of and verbal communication is sufficient to keep all nodes updated. I want to end with a a couple of notes. First, isn't it interesting to note the coexistence of so many different monies and payments systems? Even today, a great deal of economic activity among small social networks (family, close friends, etc.) continues to be supported by gift-giving principles (including the threat of ostracism for bad behavior). This coexistence is likely to remain going forward and I think that open competition is probably the best way for society to determine the optimal mix. It is also interesting to note that almost every money and payments system requires some degree of trust. This is also true of Bitcoin. In particular, the vast majority of Bitcoin users cannot read C++ and even for those that can, most are not about to go and check all 30MB (or so) of the Bitcoin source code. Nor will most people know what to do with a 30GB (and growing) block chain. Core developers? Mining coalitions? Who are these agents and why should they be trusted? The protocol cannot be changed...really? It won't be changed...really? It's just software, my friend. There's no guarantee that a consensus will not form in the future to alter the program in a materially significant way that some users will not desire. The same holds true for any consensus protocol, including the Federal Reserve Act of 1913 and the U.S. Constitution. In my view, people will come to trust Bitcoin (or not) depending on its historical performance as a money and payments system. This is perfectly natural. It is not necessary, for example, that a person learns precisely how an internal combustion engine works before operating a motor vehicle. Most people drive cars because our experiences and observations tell us we can trust them to work. And so it is with money and payments systems. For an excellent explanation of the modern payment system, see here: A Simple Explanation of How Money Moves Around the Banking System, by Richard Gendal Brown. Thanks for writing the background here David. This is implicit towards the end of your narrative, but one aspect of cryptocurrencies that is important is that it is a competitive industry. There is an incentive to keep the Bitcoin protocol as safe as possible, so that they don't lose customers to other competitors. Even now, there are a few cryptocurrency firms challenging Bitcoin. It's like in 18th century England, where there were private producers of small change. They built reputations and used the images on the observes of the coins to differentiate themselves. Nice paper, thanks for the pointer! For any of your readings who are interested, I also recommend Prof. Selgin's book "Good Money" about the coin minters in England who provided small change, filling a gap left by the Bank of England. Interesting post, but I have some problems with the marble analogy. When A pays B by means of bank "transfer", there is no actual transfer of title involved. A has a deposit and B has a deposit, but A does not transfer part of his deposit to B, even though we sometimes find it useful to speak as if he does. Rather, there is a contractual agreement between A and A's bank, whereby A agrees that the bank will debit his account, in return for which the bank will procure credit to B's account (B may use a different bank). Sometimes the marble analogy is OK, but sometimes it can be misleading. If A owes B $100, B owes C $100 and C owes A $100, the bank can process these payments even when A, B or C all start with zero in their accounts, i.e. even when there are no marbles in the first place. You might be able to rescue the analogy by saying that the bank creates marbles somewhere in the loop, transfers them and then destroys the marbles again, but this is a fiction and there need be no fact-of-the matter which will tell you definitively where the marbles were first created. More importantly, you then have to acknowledge that what is actually happening is closer to a froth of marbles being continually created and destroyed, many having transient existence, rather than a clear enduring stock. So "I view money as an object that is used to debit/credit accounts in a payments system." doesn't mean much to me. Money to me is just a measure of certain balances at particular points in time. This may not fit neatly with the ways that economists want to think of money, but I think those ways are not always helpful. 1st paragraph: seems like an unimportant detail? 3rd paragraph: just balances? What is the purpose of these (low interest) balances? Well, they're just balances like any other bank balance such as term deposits. They're distinguished by the terms under which the bank agrees to procure payments as requested, which comes down to a trade in liquidity between me and the bank where my demand for liquidity depends on how certain or otherwise I am about my future payments and receipts. The more liquidity I get (and the bank foregoes) the less interest I get. Excellent post. You might have referenced Hayek with your claim that competition is the best way for us to decide what money and payments system to use. I think I agree with all that. Technology turns what was a monopoly for the Fed into a competition. In respect of money as unit of account, the monopoly, continues, even if that rests not on law, really, but consent, or eq'm. And so long as Fed money is the unit of account, the Fed can still do its job, restrained partly by mandate, and partly by the threat that if the job was done badly, contracts would become demonimated in something else, like the unidad de fomento in Chile [as described by Shiller]. Thanks for that reference to Shiller, Tony! Is there a technical reason why the number of Bitcoins is limited? Can this limit be removed without consequences?